A cozy complement to your full-length sofa, this customizable loveseat will complete the look and function of your living room. 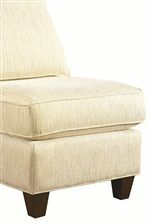 Complete with sock arms and a skirt covering its base, this item exudes a relaxed, casual design that is sure to soothe both the body and mind. 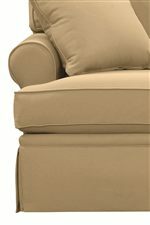 With coil flex suspension and plush upholstery over boxed edge cushions, this loveseat provides durable and consistent comfort throughout the life of the product. 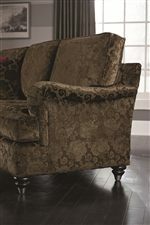 This loveseat is available with your option of seat cushion, arm type, back type and base type. 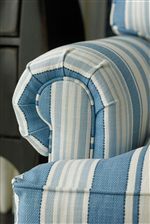 Choose from Full Front (F) or T Front (T) seat cushion; sock, panel, pleated, Charles of London or track arm; boxed edge, knife edge, or bed pillow back; and finally, turned leg, turned leg/ w ferrule, skirt, bun leg or tapered leg base. 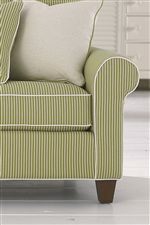 The Custom Upholstery - Medium Scale Customizable Loveseat with Sock Arms and Skirt by Bassett at AHFA in the area. Product availability may vary. Contact us for the most current availability on this product.